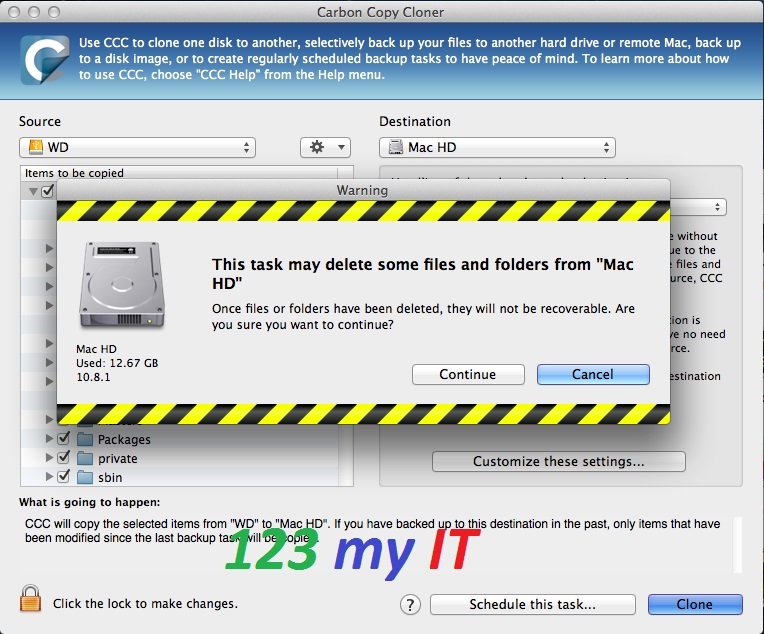 This is my latest video on how to clone OS X Mountain Lion and Lion by using an app called Carbon Copy Cloner. The direct download links for Carbon Copy Cloner are listed on under my Downloads section which can be found here. The are many benefits to using this method, but the main reason to use this is to allow you clone the same copy of OS X Mountain Lion or Lion, including all your applications and settings from one PC to another PC. So lets say you are in a work place environment and you have 10 laptops to install apps and wifi settings, rather than installing one at a time, you can create one master image and take a copy of that on your USB drive then clone that image onto all your other laptops. There are some buts to doing this, you can only close software to the PC that’s can load and runs that version of OS X. For example you cannot clone a copy of Mountain Lion and expect it to run on an old Tiger laptop or one first Intel model Macs. In the video I have show you a trial version of the software, however if you are using the software for work use I would suggest you buy a copy at $39.95 its a bargain!! And it helps the developer make better software. How to create an OSX USB Recovery Disk. of the new models such as the Macbook Air don’t have a DVD player. So how can you reinstall OS X without a DVD drive??? With the OS X Recovery Disk Assistant on a USB or external drive you can format the Macs hard drive and reinstall Lion or Mountain Lion. You can also repair the disk using Disk Utility, restore a backup from Time Machine or simply browse the internet with Safari. How to install Windows 7 on an Apple Mac running bootcamp. This video is a step by step guide on how to install Windows 7 on an Apple Mac Book Pro running OSX and bootcamp. 1. Log into your Macbook Pro. 2. Open up finder and in the spotlight bar type: bootcamp. 3. Select bootcamp from the menu. 4. On the introduction screen click continue. 5. Make sure that the download the latest support software from Apple option is ticked. If you already have a Windows partition installed you will have an option called Remove Windows 7. If you dont already have Windows installed you will have an option called Install Windows 7. Make sure you tick install Windows 7. 6. Have your 1GB USB key handy to download the Windows Support Software from Apple. 7. Now you can choose to save a copy of the Windows support software to DVD or USB. I prefer USB. 8. Select save a copy to an external drive. You can run this software after Windows have been installed. 9. The Windows support software will download to the USB. 10. At the create a partition for Windows screen you can make the partition as big as you want. However press divide equally so you will have a shared amount of space on both drives. 11. In-cert your Windows 7 DVD and click install. 12. Boot camp will start to Partition the drive. 13. Your Macbook will restart. 14. Windows is loading files screen. 15. At the Windows 7 install screen select your Language, time and currency format and Keyboard and input methods. Click next. 17. Accept the licence terms and agreements and click next. 18. Click on custom menu. 19. Select your bootcamp partition and click drive options. Hit Delete then click Ok.
20. Select the partition again and click on New, Apply and Next. And Vista will start to install. 21. The Mac will restart. 22. Setup your new Windows 7 profile and you are done. How to make a bootable OSX Mountain Lion USB drive. This video is a tutorial on how to create a bootable osx mountain lion USB drive. This step by step guide will show you how to download and extract the mountain lion files and install them to a USB drive so then you can boot into that usb drive and install OSX on a mac. How to do a clean install of OSX mountain lion from a DVD. This is a tutorial on how to do a clean install of OSX mountain lion on a macbook pro from a DVD.